The annual friendly match took place at The Glen Golf Club today. Unlike last Sunday the sky was blue and the sun shone though there was an edge to the stiffish wind which also made for a testing back nine. The matches were all played in the friendly spirit we expect from this match. 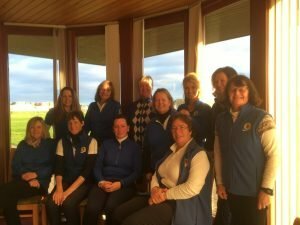 All the matches were closely fought finishing at the 16th, 17th, and 18th holes with East Lothian the victors. The annual match v Gullane GC for the Percy Vere Trophy took place today on a beautiful sunny winter Sunday. There was some great golf and all the matches were played in good spirit. The score lines in some of the matches did not reflect how closely the holes were contested. We all enjoyed a meal in the clubhouse afterwards as guests of Gullane. I regret to report that the trophy was returned to the safekeeping of Gullane GC after their 3.5 – 2.5 win. The first of the winter season squad events took place today with our annual friendly match v. Lanarkshire. There were familiar faces in both teams and a chance to for some to catch up. The match was played over Gullane No.2 on what was a sunny but cold late autumn day. It was a friendly in name and friendly in nature though still very competitive with four of the matches going to the 17th or 18th. The result was an amicable half. 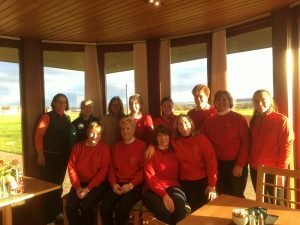 The final winter squad event was our annual friendly match v Borders County. The match was reduced to three foursomes matches played off handicap since Mother’s Day was a popular competing event!. 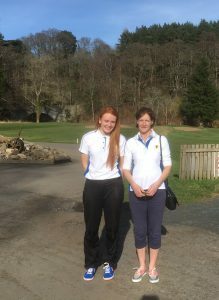 The match was played at Torwoodlee in glorious spring sunshine and as Kay and Lauren demonstrate cut offs and polo shirts were to the fore. Borders welcomed us with soup and sandwiches before the match and Tea and a wonderful spread of cakes and meringues after the match. Both the match and the cakes were enjoyed by all. Sadly we lost the match 2-1. The team took on Gullane GC today in the annual match for the Percy Vere Trophy. The conditions were testing to say the least with winds gusting to 40pmh at times. We were however spared the worst of the rain and the match as always was played in good spirits. Steven and his team looked after us well in clubhouse and we all enjoyed the post match hospitality and chat over high tea. Our thanks go to Gullane GC for once again extending their hospitality and for their good wishes to the team in the Inter County Matches at Stirling later in June. I say we played for the Percy Vere Trophy but the elusive Percy was not to be found. Having been missing last year he was found and returned to the clubhouse but was no where to be found this afternoon. We will however persevere and I am sure Percy will take pride of place on the table next year. Congratulations go to Gullane GC on their 4-2 win. The first of our winter friendly matches was played at Strathaven GC yesterday in what proved to be a lovely autumn day. The games were played in great spirit and 4 of the 5 matches went to the 18th. One match finished at the 16th, I am not sure if they had decided that since they were at the clubhouse so there was no point playing up the hill just to come down again or if they hoped to gate crash the Halloween party in the clubhouse and dook for some apples. While we did not have to trick or treat we did enjoy some very ggod some and sandwiches after the match. And the result? Yes the team won 31/2 – 11/2. A good start to the winter season. Well done everyone.